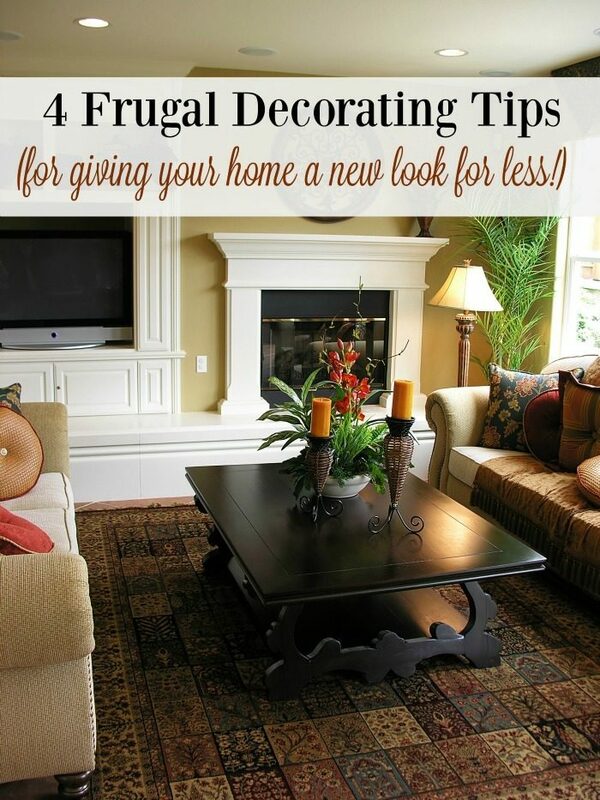 4 Frugal Decorating Tips! Give Your Home A Makeover For Less! You are here: Home / DIY / 4 Frugal Decorating Tips! Give Your Home A Makeover For Less! If you love to decorate and freshen up your space but are on a tight budget, there are some fantastic ways you can get a new look without spending tons of money. 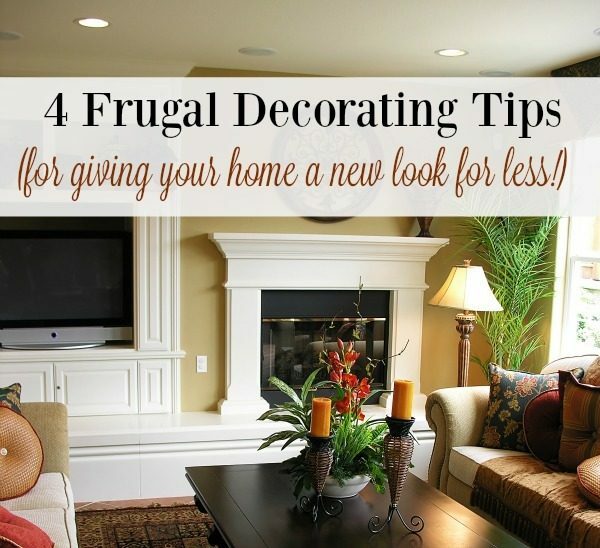 Here are 4 Frugal Decorating Tips for giving your home a makeover on far less. Photo#1 You can absolutely have a beautiful home that reflects your personality for very little money! 1. Try Rearranging & Repurposing – Sometimes all you need is to get creative with what you already have and find fresh ways to display your most loved pieces. Move that couch that’s always been in the same place to another wall, or put it on a diagonal. Put that bench from the entryway to use at the kitchen table. Use that dresser as a buffet in the dining room. Think outside the box! Maybe all those old lamps need is a good dusting and a new shade to look fabulous again. 2. Bring In Fabric– Even if you don’t sew you can buy a couple yards of any fabric that catches your eye and create curtains, valances, pillow covers, runners, dust ruffles,or swags. There is this amazing product that will make a sturdy seam with just an iron called Stitch Witchery! If you can sew a relatively straight seam and push an iron you can make fabulous decor for just a few dollars. Be sure you utilize coupons at the craft/fabric store, most have coupons running all the time for 40% or so off one item. Just have your fabric cut into one piece at the store, and cut it into smaller lengths when you get home. Also, try swapping out your usual throw or pillows for a color more fitting of the season. Even adding a bright new tablecloth to the dining table can give a whole new look to the room! 3. Paint Something – This is my favorite frugal decorating tip! There are two ways you can use paint to update your home and make it feel fresh and new – either a bold pop of colors on the wall(s) or by spray painting your knick knacks and small furniture pieces. I am not at all afraid of color, to me a gallon of paint is well worth the update it gives to any room! Most big box stores have mis-tints that they sell at a fraction of the regular price. They also frequently run sales on paint. Spray paint is one of the most amazing inventions known to man as far as I am concerned- Spray lamp bases, frames to coordinate for a picture wall, side tables to update their look, old plastic patio furniture and more. Not only does a can of spray paint go a long way, but it comes in so many different finishes! 4. Shop At Thrift Stores/Yard Sales – Keep an open mind as you look, like I said before many things can be transformed with a little paint and/or fabric. Frames are always a great way to decorate, even if they are not your color, style, or the photo inside is outdated. You can always paint the frame, pop a new picture in, or paint over the picture with chalkboard paint and make your own DIY chalkboard. Even china knick knacks from the 60’s and wooden cheese boards have plenty of life in them with a little updating with spray paint. Not to mention that thrift stores are a great place to find baskets for organizing your home. Hopefully these ideas on how to decorate on a budget have helped you see that you can have a beautiful home without spending lots of money! What are your favorite frugal decorating tips? Do you have any tips or ideas to spruce up a living area for less? Sometimes you just have to look at things differently to get new ideas on a space and how you can improve it. Look at what your friends are doing, or look through magazines, or check out Pinterest for ideas. You can do this on a budget and you’ll be happy you did, don’t let your budget hold you back! Manuela blogs at A Cultivated Nest (www.acultivatednest.com) a frugal homemaking blog. Her mission is to help women cultivate a love for the home they have now and to make the most of what they have. She writes about ways you can save money, homemade cleaning and beauty products, managing/organizing your home, how to decorate and garden on a dime, easy crafts, and also shares recipes that are easy and budget friendly. Wow very nice, simple but beautiful ideas!! I agree! It’s nice to spruce up every once in a while, and I love doing it frugally!